During the 2012 protests in Bucharest. Demotix/Reporter#8077. All rights reserved. Mass street protests, riots, human rights abuses, contentious legal reforms to mask corruption... In the past two years, Romanian society has gone through a series of unprecedented crises that have all but reversed the pro-western trend started with the countries' accession to the European Union, prompting harsh words from Brussels and Washington. “Romania’s adherence to the Copenhagen criteria is now being questioned by our allies”, President Traian Basescu said recently on national television. Unlike west European countries like France, Italy, and the Netherlands, however, the crisis of Romania’s elites has not led to a rise in xenophobic or extremist politics but to a digital revolution that has shaken traditional assumptions about democratic change to their core. Following mass demonstrations over the introduction of new health care legislation that would have reduced state funded health benefits - the “Romanian winter” of 2012 - street protests became the norm. I was fortunate enough to be among the thousands that took to the streets, camping out near Piata Universitatii (University Square) in Bucharest. I witnessed something that few thought possible: the living, shouting, banner-waving expression of a silent majority born around the Romanian revolution, too young to remember the fall of Communism, but too old to continue to sit idly by. A grass-roots movement emerged in the spirit of Occupy Wall Street, energized by the enthusiasm and idealism that only youth can so well exude. We shouted then that no more will we allow vested interests to call the shots, that united we will bring about the much needed transformation of Romanian society. A new way of doing politics was what was asked for. We had no political alignment and no political figure was championed. But, like most such movements, its momentum slowly petered out, pushed away from the streets by the cold January winds, the resignation of the government and the scrapping of the health reform. Those that took to the streets, however, achieved an important symbolic victory. But that was only the beginning. Under the premiership of Victor Ponta, Romania has slowly drifted further and further away from the commitments made after joining the European Union in 2007. In the summer of 2012, a referendum was organized to oust the incumbent President Traian Basescu over allegedly breaching the Constitution. The referendum was judged by both European and American officials as being undemocratic and against the rule of law and European Commission President José Manuel Barroso even issued a list of precise recommendations that were to be followed by the Romanian government under the binding law of the European Treaties. 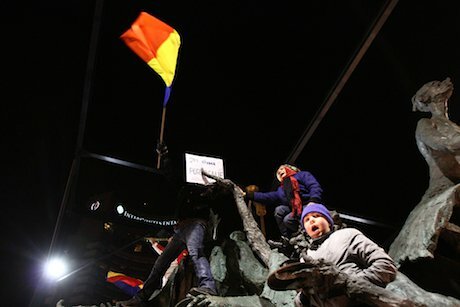 The chasm separating mainstream political life from the realities of Romanian life widened in the following months, peaking in the autumn of 2013 with the revival of the public protest movement. This time, the unifying theme consisted of the gold-mining operations that were about to start in the town of Rosia Montana (M. Gotiu has an excellent take on this topic). Hundreds of thousands took to the streets, demanding the scrapping of the proposed mining operations. Unlike the last time around, though, the movement didn't fade away but instead morphed into a powerful online presence, uniting a multitude of public gripes and grievances under a common banner. The hashtag #unitisalvam (United we save) has since been used to cover a wide array of topics, from legal breaches and petty corruption to a controversial shale gas operation in Pungesti operated by Chevron. Politicians discovered a resource more important than gold or gas: the power of the crowd. The projects were halted and the streets scored another victory. This online revolution then turned its attention to the way several new amendments were added to the Penal Code, which essentially decriminalized corruption by erasing the concept of conflict of interest for MPs. Public protests soon followed, albeit of a lesser magnitude, but large enough to catch the attention of the international media. On 15 January, the incumbent government of Victor Ponta was dealt a new blow to its already shaky international standing when the Constitutional Court judged the new series of contentious amendments to the Penal Code to be unconstitutional. There is little doubt that, had the amendments been passed, Romania’s democratic values and the rule of law would have been severely threatened. No minister, deputy, senator, member of the local or county council would have been held criminally liable for using their public positions to enrich themselves or members of their families (see here). But what is important to underscore here is that, despite the drama that has defined Romanian politics for the last several years, the country’s citizens have shunned all forms of political extremism, opting instead to head for the streets and shout their complaints loud and clear. Unlike most other EU countries, who have been hit by an unprecedented wave of far-right electoral successes, Romania followed a different course, with polls showing virtually no rise in voting preferences towards extremist parties. Economic and social hardships, unemployment, widening inequalities were translated into this amorphous, almost continuous protest movement. The upcoming European elections will be a perfect opportunity to assess the impact that the movement has had on Romanian political life. Since no extremist parties are set to win seats, it is expected that #unitisalvam will experience a strong revival, keeping the government accountable by signalling any abuse that might take place. The ruling coalition has yet to publish the names of its endorsed candidates for the EP. Once they are announced, the movement will most likely be able to leverage its success, influence the government to respect the rule of law and make its ideas appear in the political platforms of mainstream parties. With elections getting closer, expect more buzz as both social media and offline media ensure that #unitisalvam will be an important part of the news cycle. It is a clear sign that the rules of the game are on the verge of changing. With an ever-decreasing electoral turnout across the western world, the power of the ballot box will start giving way to the power of the hashtag. #unitisalvam, and the movement it created in its wake, have managed to force change using non-violent means, acting like an external accountability mechanism for the government. The message that they have conveyed is that unstructured non-political movements, wielding 2.0 tools, can impact politics on a point-by-point basis and channel popular frustration away from extremist parties and their controversial world views. The Romanian protestors have proved that there is a better way to cleanse the political class of a state, and that’s something we can all listen to.